If you’re a Mac user interested in ripping your commercial DVDs to a format playable on an Apple TV, iPod, or iPhone, the free video transcoder, HandBrake 0.9.3, is one of the easiest ways to go about it. With a copy of the free VLC installed on your Mac, HandBrake can rip most DVDs made today, and the results it produces are quite watchable. But suppose you want to go beyond the defaults—tweak HandBrake to produce videos that take up less room on your iPod, dispense with a movie’s closing credits, or bear subtitles? It’s all possible with HandBrake, but it takes some tweaking. And tweaking HandBrake is what this article is all about. Creating software to extract video from the copy-protection system used on DVDs is illegal under the Digital Millennium Copyright Act (DMCA)—even if you're doing it only to extract video from your personal DVD collection for your own use. Common sense would say that it's ethical for you to move the video from DVDs you have purchased onto your own devices for your own personal use. (We're also quite sure it's flat-out wrong to rip video from DVDs you've rented or borrowed, or to give video files you've converted from your own DVDs to a friend.) But common sense and the law don't always intersect. Some court rulings suggest that it's not unlawful to circumvent DVD protection for non-infringing purposes; on the other hand, the Motion Picture Association of America maintains that any DVD ripping violates the DMCA. So what's a Mac user to do? Because the law is not completely clear on this matter, every user will need to personally assess the risks involved in ripping DVDs they own for personal use. For all other cases, however, we encourage you to do the right thing and buy a legal copy. We’ll work our way from the top of the HandBrake interface to the bottom, pointing out useful features along the way. Title When you insert a DVD or load a Video_TS folder from a DVD that contains a feature-length movie, HandBrake will automatically choose the portion it believes to be the main feature. But click the Title pop-up menu and you’ll likely see some other entries. Much of these reflect parts of the disc you’re not interested in—FBI warnings or an opening logo, for example. But some of the longer entries might be previews or extra content. How to tell? From this menu choose an entry other than the one selected by HandBrake and click on the Picture Settings button near the bottom of the window. In the resulting sheet, you’ll see a preview of the selected content. If that preview shows the FBI logo, you can safely move on to a different entry. If, instead, you’re ripping a DVD full of TV episodes, you’ll want to rip more than just the single episode recommended by HandBrake. Before you begin, choose HandBrake -> Preferences and in the General preference enable the Use Auto Naming option. This ensures that each episode will have a unique name. Now click on the Title pop-up menu and select an episode. Configure your settings, and click on the Add to Queue button. Repeat these steps for all episodes on the disc. Because you’ve enabled the Auto Naming option, each will have a unique name. (Without that option on, there’s the danger that you’ll overwrite one episode with another because they bear the same name.) Click on Start and HandBrake will encode each episode in the queue. Chapters It’s a good bet that a movie’s credits will be found in its last chapter. If you’d like to do without these credits, choose the penultimate chapter from the second chapter pop-up menu. So, for example, if a movie has 32 chapter, choose 31 from the second pop-up menu. When you rip the disc, that last chapter won’t be included in the final product. Format HandBrake can output video in four different container formats—MP4, MKV, AVI, and OGM. For those using Apple’s media players (QuickTime, iPod, iPhone, Apple TV) there isn’t a good reason for using any container format other than MP4. Select the Video tab and you find settings for controlling the encoding of a movie’s video settings. Video Codec Each container format supports its own collection of encoders. We’ll concentrate on those offered with MP4. HandBrake supports three encoders for its MP4 files—MPEG-4 (FFmpeg), MPEG-4 (XviD), and H.264 (x264). FFmpeg is faster than XviD, but you pay for that speed with a slight compromise in quality. H.264—the default setting used for many of HandBrake’s presets—produces good looking results at low bit rates. But it’s slower to encode than the other two encoders and requires more processing power from the device that plays the video. If you’re creating video for an old computer and find H.264 playback choppy, try FFmpeg or XviD. Framerate You can reduce the size of your movie by cutting its framerate but you’ll suffer some quality loss in the process as your video can be choppier than it would be at the original framerate. None of HandBrake’s presets do this, but if you’d like to give it a go because you have very little storage space to work with, choose a different framerate from the Framerate (FPS) pop-up menu. For best results, choose a framerate that fits into the original neatly. For example, 15 fps for a 30 fps (29.97) source. 2-pass encoding When, in HandBrake’s Quality area, you’ve chosen either the Target Size or Average Bit rate settings (discussed shortly), a 2-pass encoding option appears within the Video tab. Enable this setting and HandBrake will run through your movie twice. The first time, it records information about the density of information within the video’s frames. On the second pass, it uses that information to better allocate bit rates during the encoding process, resulting in better-looking video. The downside is that 2-pass encoding takes twice as long. To speed it up (and lose a measure of quality), enable the Turbo First Pass option, that knocks 50 – 75-percent of the encoding time off the first pass. Quality The settings in HandBrake’s Quality area are where you can make a real difference in the size of your resulting movie and, of course, its quality. Enable Target Size and you can tell HandBrake how big you’d like the resulting movie to be. (The larger the file size, the better the quality.) The Average Bit rate (kbps) option works the other way around. You tell HandBrake what you’d like the average bit rate to be and it creates a movie whose bit rate hovers around that size. (Be sure to check the capabilities of the destination device in this regard. A bit rate of 2500kbps looks good on an Apple TV but is too much for an iPod.) Again, the higher the bit rate the better the quality and the larger the resulting movie. The Constant Quality slider is your way of telling HandBrake, “I want the resulting movie to be X good.” HandBrake then does everything it can to grant your wish, but “everything it can” may result in a movie that consumes a lot of storage if you’ve chosen a high quality setting or one that won't be compatible with a device such as an iPod because its bit rate is too high. Within the Picture Settings sheet (accessed by clicking the Pictures Settings button) you can preview frames from the video and change its look. These are your options. Size You use this option to reduce the dimensions of your movie (you can’t increase its size using the arrow buttons next to the Width and Height fields). For a widescreen movie, the Width will be 720. The Height number will vary, depending on the source. 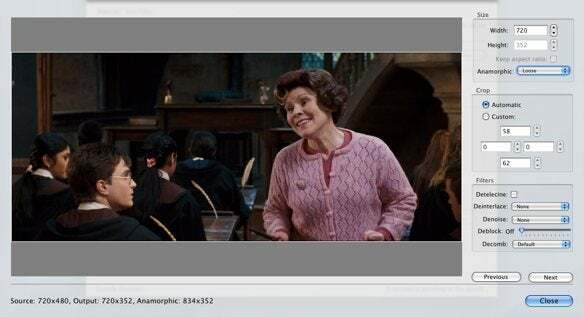 Enable the Keep Aspect Ratio option and reduce the Width or Height setting and the other setting will follow, maintaining the same aspect ratio as the source movie. You also have the option to choose Anamorphic encoding. Choose Strict or Loose from the Anamorphic pop-up menu, and the dimensions of the movie increase. The Strict option ensures that the aspect ratio conforms exactly to the ratio of the original movie. A Loose setting alters the dimensions so they are more efficiently encoded. Changing the dimensions of your video does very little to reduce the amount of storage it consumes. You’d use this setting specifically to meet the limitations of a particular player—one that can’t play video larger than 640 x 480, for example. Crop By default, HandBrake attempts to remove black bars by cropping them away. If you’re unhappy with its performance in this regard, you can do it yourself by enabling the Custom option in the Crop area and then entering the values you like in the four fields below. If your source material is a DVD burned originally from a video tape and that video shows scan lines at the top or bottom of the video, you can use crop to remove them. Filters Normally you shouldn’t have to touch the settings found in the Filters area if you’re working with a movie ripped from a commercial DVD. If your source material is made up of TV shows or animation, however, or comes from a disc you’ve created from movies you’ve shot, you might find some of these settings helpful. The Detelicine option switches on an inverse telecine process. Telecining is the act of converting film to video and adding frames in the process (because film runs at 24 fps and NTSC video uses 30 fps). The detelicine process removes those extra frames so your video plays back smoothly. Generally, only animation and TV shows require this setting but there’s no harm in leaving it on all the time as it will have no effect on content it can’t work with. Take a gander at your video’s preview image. If you see jagged lines where hard edges should be (called “combing” or “teeth”), the video is interlaced. Interlacing is a technique used in standard-definition TV for painting images in a series of odd and even lines. Interlaced video displays these jagged lines on a computer screen and some high-definition TVs. To remove it, you must deinterlace the video. HandBrake offers a couple of options for doing this. First, choose Fast from the Deinterlace pop-up menu. If the jagged lines go away, you may want to deinterlace your video. The Fast setting is indeed faster, but you lose quality. To produce better results (though you still lose some quality), choose Slow or Slower. I used the word “may” in the paragraph above because HandBrake offers another option for dealing with these jagged lines—Decomb. This option searches your video and applies deinterlacing only to those frames where the lines are visible. This helps maintain better overall video quality because not everything is deinterlaced. If your source video is really grainy, give the Denoise option a try. This filter is a trade-off. You may lose some of the grain but you also lose overall quality (gain some blocking in the Medium and Strong settings, for example). There are three settings—Weak, Medium, and Strong. Weak is the first to try on a sample (a chapter, for example). You have to try it on a sample because its effects aren’t reflected in the preview image. And finally, there’s a Deblock slider that can get rid of blocky artifacts. Again, you won’t need this setting if your source is clean. If the source is poor to begin with, this is something to try on a sample chapter. The Audio & Subtitles tab is the means for choosing which audio tracks you’d like to encode as well as placing subtitles on your encoded movies. Many commercial DVDs contain multiple language tracks—English, French, and Spanish, for example. You can reduce file size by stripping out the tracks you don’t want. HandBrake will choose the English track by default and exclude others, but you can optionally add them back by selecting additional language tracks from the Track 2, Track 3, and Track 4 pop-up menus. Within the Audio Codec pop-up menu you can choose the codec used for the movie’s audio—the default is AAC, but you can maintain the source movie’s existing audio encoding by choosing AC3 Passthrough from this menu. File size will be larger, but the sound will exactly match the quality of the original. Even if you go with the default AAC (faac) setting, you can choose the output format—Mono, Stereo, Dolby Surround, Dolby Pro Logic II, or 6-channel Discrete. Choose Dolby Pro Logic II and the audio will play on both stereo and surround-sound systems (though it’s not true surround-sound). The setting you choose should match the gear you intend to play the movie on. If you don’t mind the larger file, you can add both Pro Logic II and AC3 pass-through tracks using the Track 1 and Track 2 pop-up menus so that you have a movie that will play in stereo on your iPod or in full surround-sound on a device such as an Apple TV. With HandBrake you can add subtitles to your encoded movies if they’re available on the original source DVD. Note, however, that you can’t turn them off when viewing the movie—they’re burned into the movie.